Your general purpose lens selection short list just got one lens longer. The Sigma 24-105mm f/4.0 DG OS HSM Art Lens, featuring great image quality, excellent build quality and optical stabilization, definitely deserves your consideration. This lens is a pleasure to use, it looks great and the results from it look even better. Sigma makes a wide variety of lenses, but until now, has been missing a stabilized full-frame format general purpose lens. 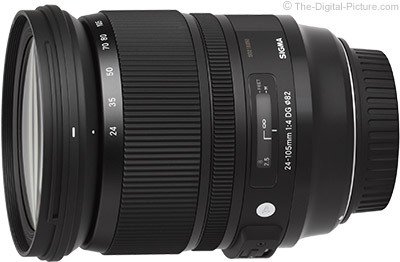 As such, the 24-105mm f/4 OS lens addition to the Sigma lineup is completely welcomed by me. By (my) definition, a general purpose lens is one that will cover a very wide range of typical photography subjects. This lens type is usually the first I tell people to get with their first DSLR camera. The focal length range is the biggest factor in my considering a lens to fall in the general purpose lens category. For those of you using a full frame format sensor, the 24-105mm focal length range found in this lens will supersede my recommended general purpose lens focal length range by a very comfortable margin on the long end. 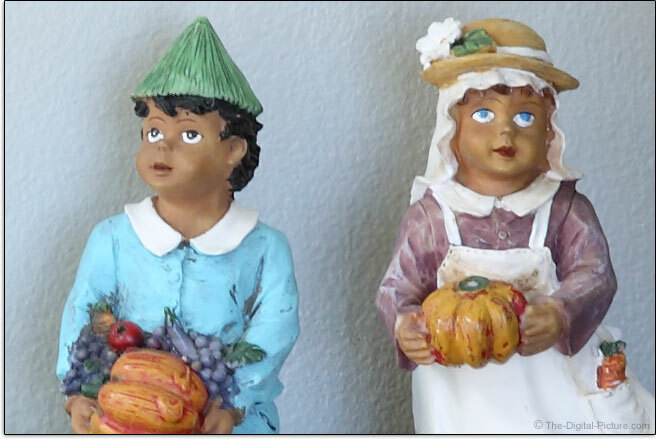 The first set of examples utilizes the printed-on-the-lens focal lengths. For the second set, I attempted to hit 28mm (I estimated slightly long) and omitted 80mm as it is relatively close to 70mm. The 24-70mm focal length range is a very common one. The comparison above shows the specific advantage of having up to 105mm available. Those on the APS-C (1.6x FOVCF) format will see an angle of view equivalent to 38.4-168mm on a full frame DSLR. This range is somewhat lacking from a wide angle perspective, but it has a very attractive long end. If your focal length needs gravitate toward the long end, a 24-105mm lens will be very useful to you. As I said, by definition, a general purpose lens has a very wide range of uses. One of my favorite such uses is for landscape photography. It is not hard to compose excellent 24mm landscape images that evoke a sense of presence and at 105mm, it is even easier to find attractive landscape compositions. People are of course hugely-popular general purpose lens subjects, and with the focal lengths up to 105mm included, this lens allows great perspective for even relatively tightly framed portraits. Zoom out to 24mm and capture the entire group and/or the environment your subject is in. The number of other uses for this lens is as vast as your imagination. Products, cars/trucks/boats/bikes, art, cities, beaches, mountains, sports (best-suited for outdoor sports), parties, pets and much more. In the Sigma press release, "Amir-Hamzeh added that this new lens combines the largest possible fixed aperture to zoom ratio that will maintain optimal integrity ..." Interesting is that, until now, the Sigma line has been completely void of fixed f/4 max aperture zoom lenses. An f/4 aperture is large, but f/4 allows 1/2 as much light to reach the sensor (one stop darker) as the f/2.8 zooms allow. But you will not find any 24-to-something zoom lenses reaching longer than 70mm with an f/2.8 aperture available. If shooting action in low light, I'm going to want one of the f/2.8 variants that will allow me to use a shutter speed that is twice as fast. If shooting the night sky, I prefer f/2.8 (the earth is in action). You of course need to decide if f/4 is wide enough for your needs. I can tell you that the image quality from this lens is indeed, as Amir-Hamzeh mentioned, "optimal" (much more to come). And great is that you have the max f/4 aperture available at all focal lengths. Unlike with a variable max aperture lens (an f/4-5.6 lens for example), you can set a wide open aperture exposure that remains constant over the full zoom range. Adding greatly to the usefulness of this lens is optical stabilization. OS makes a huge difference when handholding this lens – delivering both sharper results at long shutter speeds and better-framed results thanks to a stabilized viewfinder. Great for video recording is that this OS implementation is practically silent. Unique to this OS implementation is that it is always active if the camera is powered on and the OS switch is in the on position. And, I can hear the very faint OS noise even when OS is switched off. The difference in long exposure handheld image quality is vastly different with OS switched off, but the OS system is always running. I've never worried about battery drain when using stabilization (including with this lens), but I expect that always-on stabilization uses some additional power. At 24mm, my keeper rate was nearly 100% with a .3 second exposure which is about 3 stops of assistance for me. About 60% of my images were sharp at .4 seconds, but my keeper rate dropped quickly beyond this exposure time. At 105mm, I am getting mostly sharp results at 1/10 second with very gradual drop-off until just fewer than 50% of my images were sharp at 1/5 second. The keeper rate then plummets as the exposure duration increases. About 75% of images remain sharp at the approximately 4-stop of assistance 1/6 sec shutter speed. These tests were done under ideal conditions. If you run up a mountain and take a shot under high wind conditions, I can assure you that your .3 second exposure is not going to be sharp. But IS is still going to be beneficial in this situation. It is just that the benefit is shifted to shorter exposures. Got ideal conditions? Shoot a lot of frames and you will likely capture a sharp image (you probably only need 1) at even longer exposures than I'm talking about here. Below is a modestly-sharpened example of a .3 second 105mm handheld capture. I'm sure you agree that the difference between these two images is quite noticeable. OS works. Unless the subject is moving. 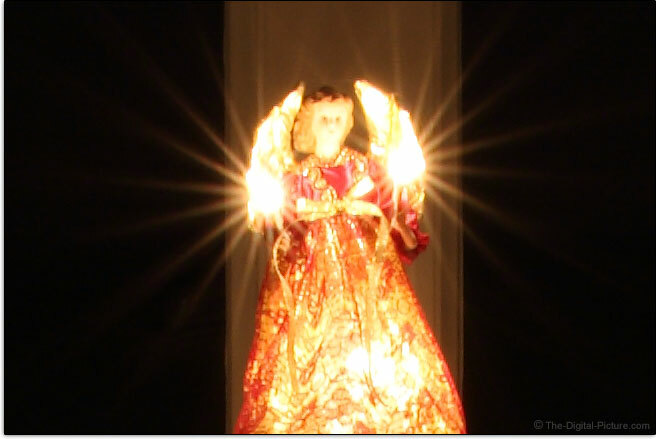 A shorter exposure is needed to stop subject motion. Since a general purpose lens is frequently the most-used lens in the kit, and since the lens can be as important (or more important) than the camera, it makes complete sense to get a high performance general purpose lens model. And in the performance category, image quality is my most-cared-about feature. Great news is that the Sigma 24-105mm f/4.0 DG OS HSM Art Lens performs extremely well and delivers especially-sharp images. At 24mm through 35mm, this lens is very sharp across the frame with some minor full frame corner improvement showing at f/5.6. Using a 1 or two stop narrower-than-max aperture usually delivers better image sharpness, but the only reason to stop this lens down to f/8 in the 24-35mm range is for increased depth of field or a longer exposure. Though still quite sharp at 50mm, I can see a very slight decline in wide open aperture image sharpness across the frame. Stopping down to f/5.6 results in a very slightly sharper center of the frame and a more-noticeable improvement in corner sharpness. Sharpness at 70mm is very similar to sharpness at 50mm, though the corners show more clean-up continuing at f/8. Still, image quality in the 50-70mm range is very good – only bested slightly by the 24-35mm results. 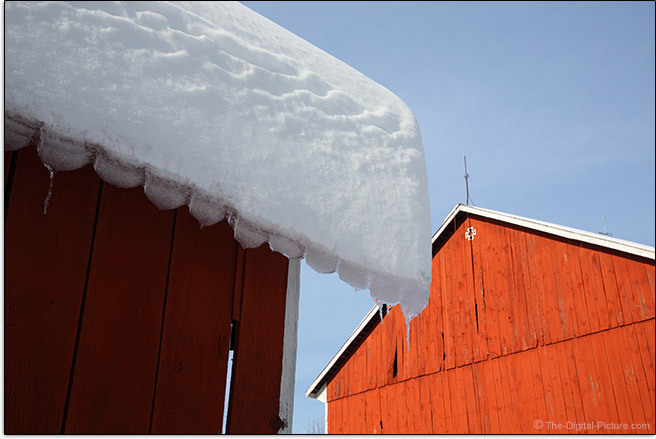 At 105mm, wide open aperture image sharpness takes a more noticeable decline. The across-the-frame improvement at f/5.6 is strong with corners showing slight improvement at f/8. While 105mm f/4 is usable, f/5.6 will make you smile big. CA is one of the most easily software-correctable lens flaws. Using a lens with a full frame image circle on an APS-C body typically results in no noticeable light falloff in the frame corners even at wide open apertures and this is the case with the Sigma 24-105. Full frame camera owners will, as usual, see light falloff when using this lens at wide apertures and still slightly at narrower apertures at the widest angle focal lengths. To be more specific, at f/4, expect about 3 stops of vignetting in the corners at 24mm and about 2.5 stops at 105mm. 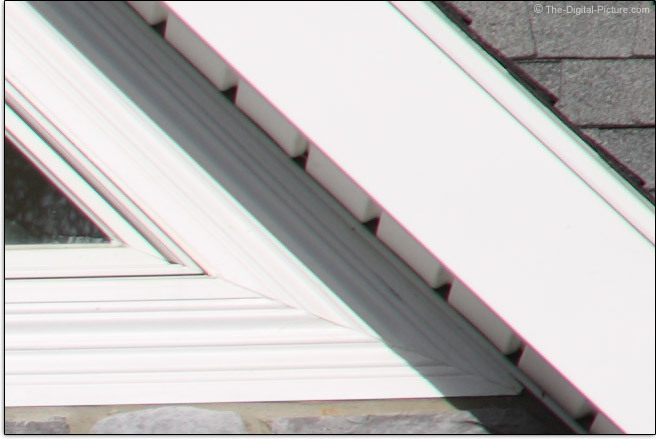 The least amount of light falloff occurs at approximately 35mm where a just-visible 1 stop of shading is seen in f/4 corners. At f/5.6, corner shading drops under 1 stop over most of the focal length range except at 24mm where 1.2 stops of corner shading remains visible even at f/11. Two days prior to my initial lens loan return deadline, the skies finally cleared for a flare test. And I'm glad that I got this test opportunity because, while not flare-free, this lens performs very well with a bright light source in the frame. The sun in the case of this test. You can count on a 24-something mm full frame zoom lens to deliver barrel distortion on the wide end and pincushion distortion at the long end. And the Sigma holds to this tradition. At 24mm, you are going to see moderately-strong barrel distortion – the center of the frame bulges outward. Zooming to a longer focal length changes the distortion to the pincushion type – with the sides pinching in toward the center. At 28mm, distortion is negligible, but moderately strong pincushion sets in soon after. 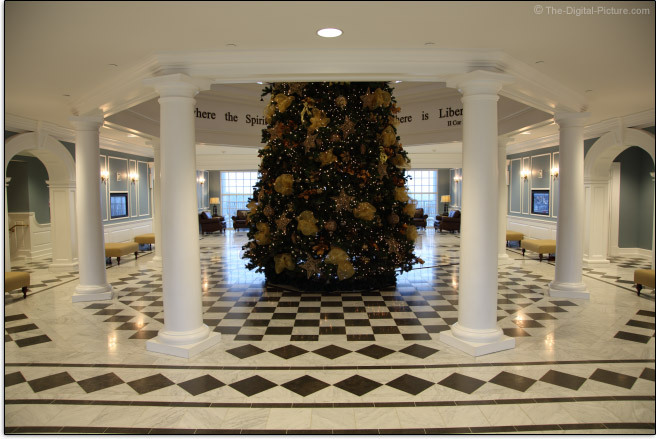 Following is a comparison of the 24-105's distortion at 24mm vs. 28mm. While distortion will not be recognizable in many scenes, a straight line near the edge of the frame will make it clear. Distortion also makes it difficult to judge when the camera is perfectly level – something I am challenged to do without optical complications. Zooming out slightly to 28mm makes a large difference in the squareness of the results. Distortion can of course be corrected in software, but this correction is destructive at the pixel level. Again, this lens performs normally in regards to distortion. I'm not sure if I like odd or even blade counts better, but more important is the quality of the foreground and background blur. And in this regard, the Sigma performs nicely. Specular highlights will show some bright borders and a couple of concentric circles inside, but they are nicely rounded even when stopped down and the circles centers are rather smooth. 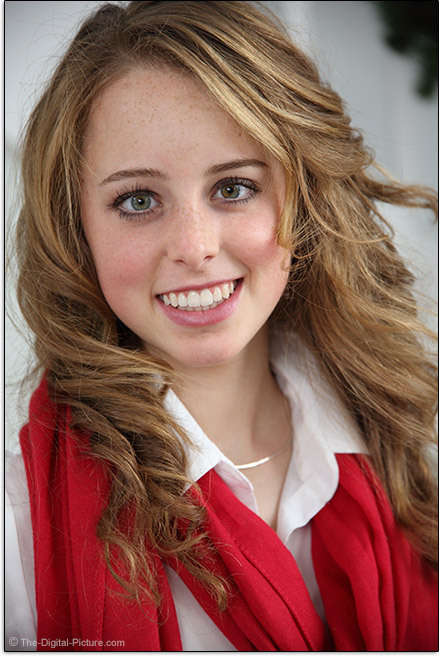 Below is a crop from near the top left corner of a Canon EOS 5D Mark III-captured image. Those are stars and stars are supposed to be round. Most lenses do not deliver round stars in the frame corners due to coma and the Sigma is again normal in this regard. Overall, I didn't find any below average Sigma 24-105mm f/4.0 DG OS HSM Art Lens image quality attributes, and the much-better-than-average image sharpness this lens delivers is going to result a lot of these lenses sold. 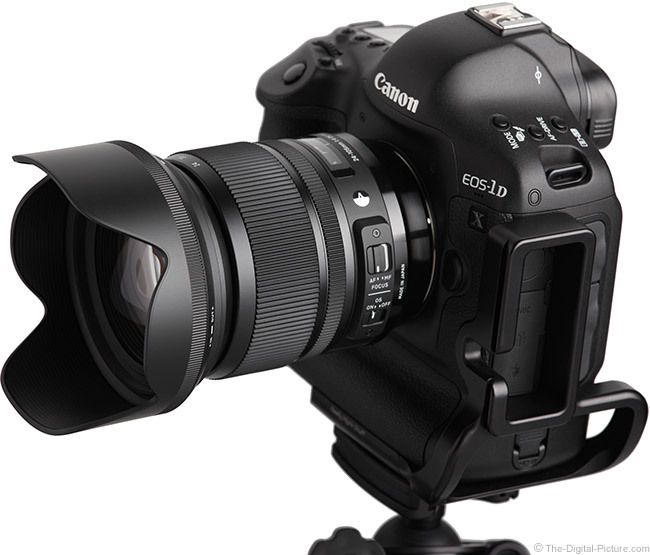 The Sigma 24-105mm f/4.0 DG OS HSM Art Lens features Sigma's HSM (Hypersonic Motor) focusing system. This particular HSM implementation is silent during use. Focus speed is reasonable, but not quite as fast as the Canon equivalent I am used to. Especially important is that AF accuracy has been good. In one-shot mode, most of my images have been properly focused. I thought that the focus speed would be an issue with action photography, but I was pleased with the good AI Servo AF performance I encountered. This lens does not have the best-available AF system for action sports, but unless the subject was very close, my results were mostly in-focus. Overall AF performance is quite acceptable. This lens is compatible with the Sigma USB Dock. The USB dock allows the lens' firmware to be updated (bug fixes, compatibility updates, etc.) and allows precise focus calibration. FTM (Full Time Manual) focusing is enabled and the lens does not change size with focusing (internal focusing). Some subject size change is noticed with focusing. This lens is not parfocal. 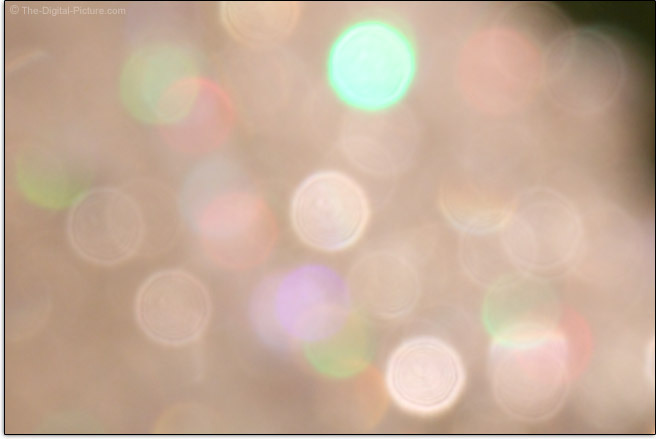 If you change the focal length, refocus. The manual focusing ring is very smooth with an ideal amount of rotational resistance. The 90° rotation is adequate for fine-focusing needs. The Sigma's 17.7" (450mm) MFD (Minimum Focusing Distance) delivers a 0.22x MM (Maximum Magnification). A .22x MM is a reasonable value and is in line with the other lenses in and near this class. No one is going to confuse 0.22x for a macro lens, but modestly-small subjects are fine targets for this magnification. I've had all of Sigma's Global Vision lenses available as of this review date and can tell you that I love the look and feel of all of these lenses. From the classy finish to the sharply ribbed rubber rings that feel great to the smooth overall dimensions (except the raised switch area in this lens), these lenses have great design quality. Like all of the other lenses in its class, the Sigma 24-105 OS extends when zooming to a longer focal length. The length of this extension is 1.86" (47.3mm). This lens features a double-extending lens barrel, but the extension remains solid even when fully extended. The zoom and focus rings are also solid – and very smooth. The switches are firm and snap into position – you are not likely to inadvertently change one of these. I know. You saw that the focus ring is behind the zoom ring and thought to yourself, "Oh no, Bryan is going to complain about that." Well, I don't want to let you down. I still like rear-positioned zoom rings and front-positioned focus rings best. The camera and lens balance point is at the rear of this lens. That means that my thumb and first finger goes into the nicely rounded rear section of the lens and from that hold position, I reach forward to the zoom ring. And that means that the focus ring is in the middle, available for accidental rotation. I want there to be no chance that I unintentionally rotate the focus ring after focus is acquired. However, this position is not such a big deal for this lens. Partly because this focus ring is rather narrow, partly because the zoom ring is raised and partly because the zoom ring rotation resistance is firm. When I reach forward, the large, raised zoom ring is very easy to find. This ring is solid and very smooth with just the right amount of resistance. No zoom extension lock switch is provided. Though I encountered some reverse gravity zooming when shooting with the lens extended and directed straight upward, I have not encountered any typical gravity zooming. Even when shaking the lens. I can't predict what will happen after a long period of use, but ... the lens is great as-is. Note that the zoom and focus rings rotate in the Canon direction – opposite that of Nikon lenses. The same reasons that keep the focus ring out of the way also make it harder to use. Being small with ribbing covering only a portion of it, the focus ring is not nearly as easy to find and use as the zoom ring. Especially in the dark. And especially with gloves on. The weight of this lens is noticeable, but not excessive. It is a bit heavier than the other f/4 lenses in its class and still slightly heavier than most 24-70 f/2.8 lenses. The size of this lens is very similar to the other lenses included in the chart below. 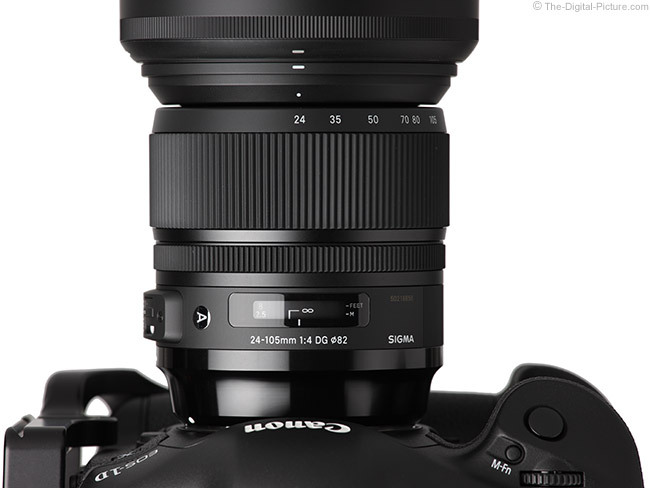 For many more comparisons, review the complete Sigma 24-105mm f/4.0 DG OS HSM Art Lens Specifications using the site's Lens Spec tool. When you pick up this lens, it has enough size and mass to feel substantial, but not that much to become burdensome. I've carried this lens for long periods of time with no remorse for having done so. Especially after seeing my images later. As with all Sigma lenses, the lens hood is included in the box. The rear of this modestly-sized hood has a rubberized surface that, in addition to the molded-in ribbing, makes it easy to grasp for bayonet installation/removal. I seldom take this hood off or even reverse it. Having the hood in ready-to-use position makes using the lens faster to use – which is especially helpful for a lens that I leave on the camera ready for quick use around the house or from the bag. My bag for this lens has been the Lowepro Toploader 70 AW. 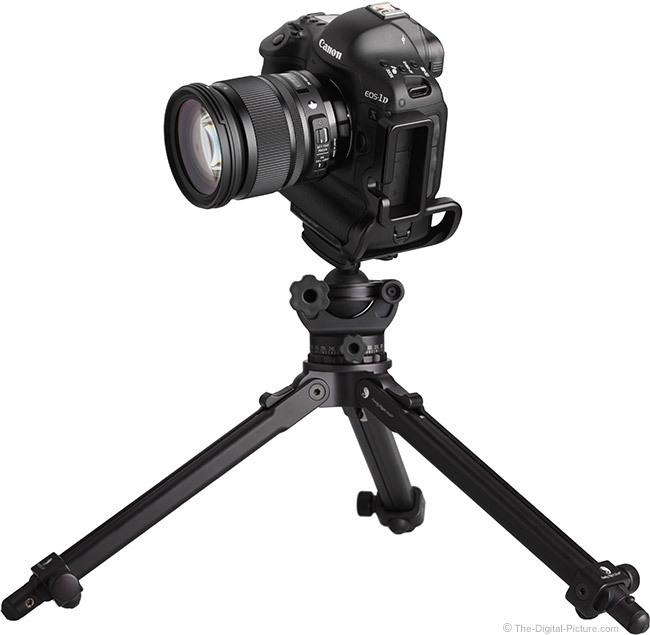 It provides just the right amount of room for a DSLR mounted to the 24-105 OS with the hood in ready-to-use position. I often forgo lens cap use when casing in this way, making the kit even faster to use. Sigma includes their padded, zippered nylon case with this lens. The case is quite protective and a nice included accessory. A 1.75" (440mm) loop is provided for belt attachment. 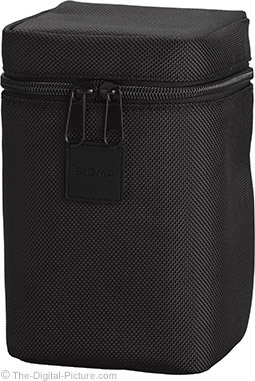 I personally prefer the Sigma cases to the minimally protective Canon lens pouches. Sigma recently improved their lens cap design, making them easier to grasp for installation or removal even inside the installed hood. The 82mm filter threads this lens has received are becoming increasingly common. 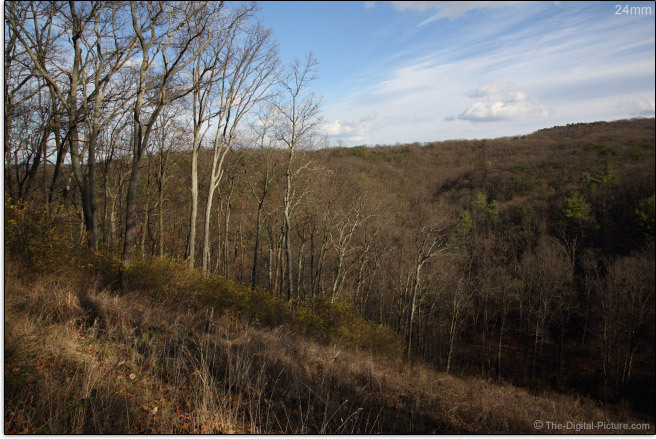 Take note that using a standard thickness circular polarizer filter will increase light falloff in frame corners. I highly recommend using a slim model such as the B+W XS-Pro. All Global Vision lenses receive a designation of "A" for Art, "C" for Contemporary or "S" for Sports. As I said before, I love what Sigma is doing with their lenses right now, but I'm not yet a fan of potentially limiting the usefulness of a lens to one of these categories. And, I was not sure why this lens received an "A" (vs. a "C" perhaps?). I posed this question to Sigma with the response being "The 24-105 was placed in the Art line because it fits the criteria best- large fixed aperture designed for a more artistic vision." I'm more of the opinion that an f/4 aperture is medium wide, but it is indeed fixed. 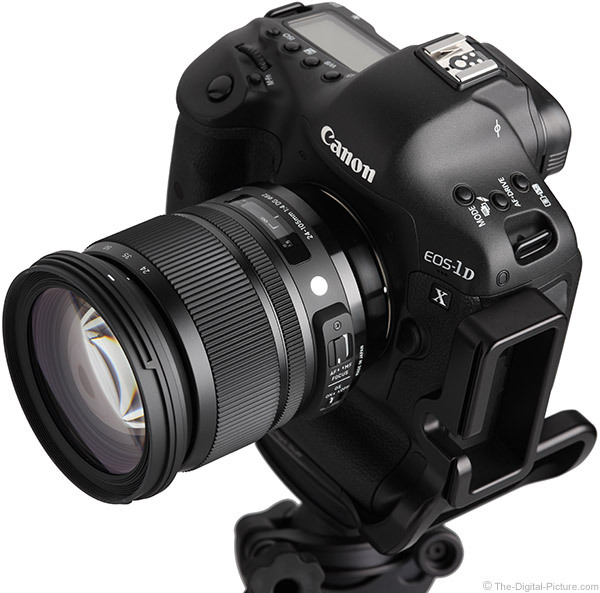 The excellent image quality this lens delivers will indeed enhance your artistic expression. 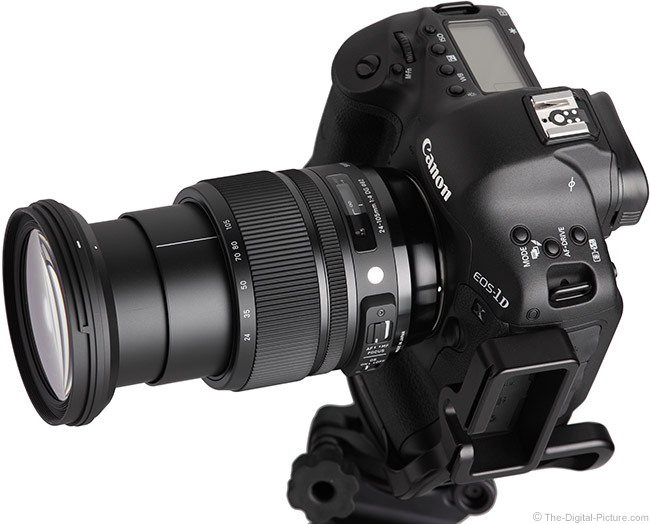 Here is a look at the Sigma 24-105 OS positioned between three other f/4 zoom lenses. While all of these lenses (and the f/2.8 zooms as well) can be compared both optically and physically in the site's comparison tools, the Canon 24-105 L IS has been my most-used Canon lens to date. And this is the lens I really wanted to compare to the Sigma. 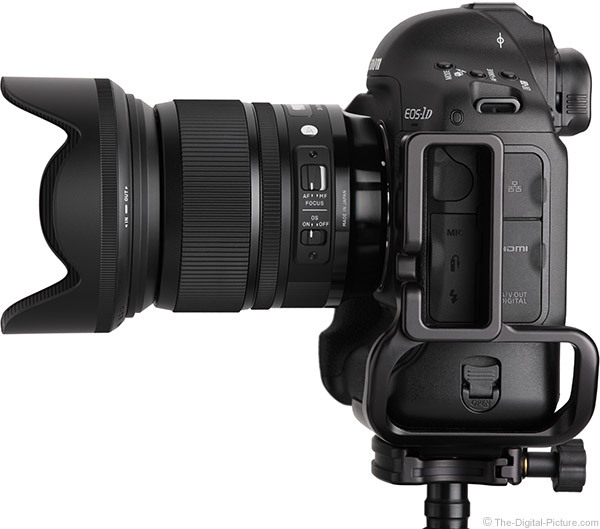 The Sigma enters life with a big challenge on the Canon side of the fence. Canon's focal length range and max aperture equivalent lens has been a long-time favorite that delivers great overall performance at a reasonable price. The bottom line is that I could be very happy with either of these lenses as my sole general purpose zoom and that they are more similar than different. From a wide open aperture sharpness perspective, the Sigma performs better in the mid and peripheral areas of the image circle at 24mm through 28mm. The two lenses are nearly equivalent from 35mm through 70mm. The Canon is sharper at 105mm. When using a zoom lens, many of us tend to use the two focal length extremes the most. Sigma wins the 24mm contest and Canon wins at 105mm. But that's at f/4. Stop down to f/5.6, and you'll be hard pressed to find a difference in sharpness between these lenses. The Sigma has slightly more light falloff at long end but shows less flare. The Canon has less pincushion distortion in the mid focal lengths. 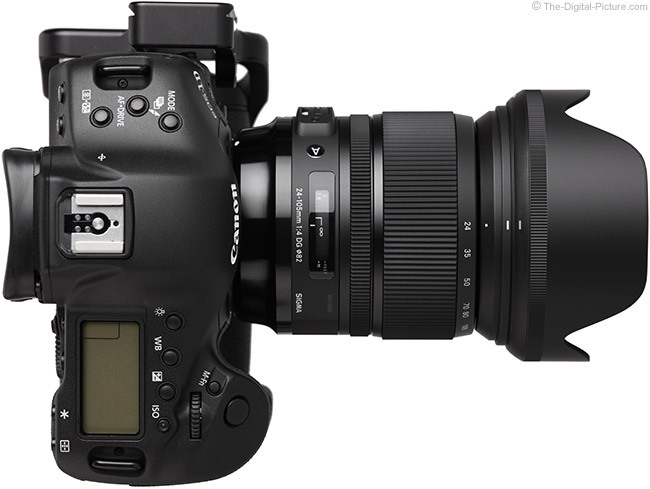 The Sigma focuses more quietly than the Canon, but the Canon focuses a bit faster than the Sigma. 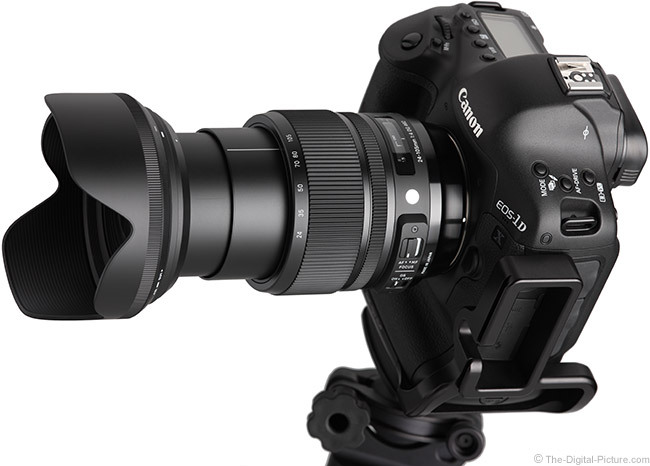 The Canon has a larger and better-positioned focus ring with more rotation (122° vs. 90°). The Canon uses smaller filters (77mm vs. 82mm), but the advantage should go to the size that is already in your kit. 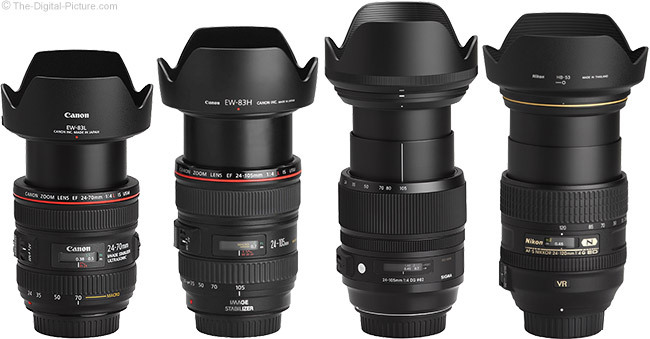 The Canon lens is lighter and slightly smaller – and is weather sealed. 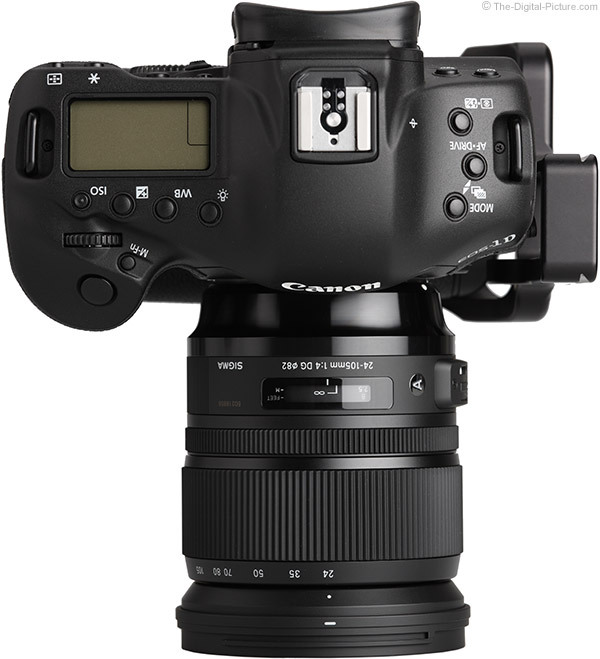 So, the Sigma presents a strong challenge to this Canon lens. Price is probably going to make the difference to many. Price, for most of us, matters. And the good news is that the Sigma 24-105mm f/4.0 DG OS HSM Art Lens has a modest price tag – especially for what you get. If you compare this lens' price to the price of the Canon 24-105 L, it looks like a very good deal. If you compare the price of this lens to the frequently-been-available white box version of the 24-105 L (a lens pulled from a camera and lens kit), the Sigma's price is not such an advantage. The reviewed Sigma 24-105mm f/4.0 DG OS HSM Art Lens was loaned to me by Sigma. I usually buy my review lenses online/retail, but Sigma made a production version of this lens available to me before this lens hit retailer warehouses. So I accepted their offer. 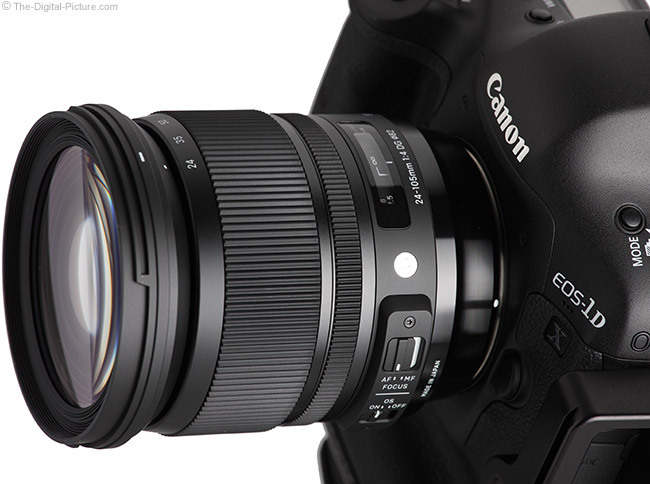 The Sigma 24-105mm f/4.0 DG OS HSM Art Lens is available in Canon (reviewed), Nikon and Sony/Minolta. My standard disclaimer: There are potential issues with third party lenses. Since Sigma reverse engineers (vs. licenses) manufacturer AF algorithms, there is always the possibility that a DSLR body might not support a (likely older) third party lens. Sometimes a lens can be made compatible by the manufacturer, sometimes not. There is also the risk of a problem that results in the lens and body manufacturers directing blame at each other. 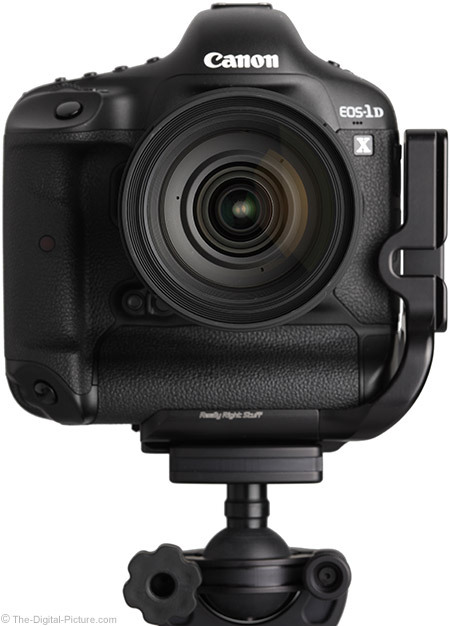 Compatibility with the Sigma USB Dock is risk reducing as Sigma can release firmware updates for the lens. Sigma USA's 4-year warranty is superior to Canon's standard 1 year warranty (Sigma's international warranty is also 1 year). Worth noting is that, as a Global Vision lens, the 24-105 OS qualifies for the Sigma Mount Conversion service. For a fee, Sigma will convert your 24-105 OS to a different manufacturer mount (from Nikon to Canon for example) to protect your investment. I've tested a lot of lenses that made me anxious to move on. This is not one of them. I would have no problem making this my primary general purpose lens. The Sigma 24-105mm f/4.0 DG OS HSM Art Lens' long focal length range will take a broad swath out of your angle of view needs. This great-looking lens is a joy to use and the results from it are even exciting to view. For a reasonable price, the Sigma 24-105mm f/4.0 DG OS HSM Art Lens reliably delivers the excellent image quality you are looking for from your DSLR camera. Which 24-105mm Lens Should I Get?